'Greentree', the Payne Whitney estate designed by d'Hauteville & Cooper c. 1903 in Manhasset with landscaping by Guy Lowell. Whitney, born William Payne Whitney, was the second son of William Collins Whitney (and younger brother to Harry Payne Whitney) but dropped William from his name after a falling out with his father after the elder's decision to remarry after his mother's death (Payne being his mother's maiden name). Following William C. Whitney's death in 1904 the bulk of his estate was given to eldest son Harry and only a small fraction (everything is relative) going to younger brother Payne. Payne was very close with his uncle Oliver Hazard Payne who upon his death bequeathed him a large portion of his estate while leaving nothing to brother Harry. Payne Whitney was a very successful businessman associated with the Great Northern Paper Co., the First National Bank of New York, the Whitney Realty Co., and the Northern Finance Company. Along with his wife Helen Hay Whitney he ran Greentree Stable, an interest also taken up by their son John (Jock) Hay Whitney and daughter Joan Whitney Payson. In May 1927 Whitney was playing tennis with a friend in the indoor court at 'Greentree' when he fell ill. Twenty-five minutes later he was dead of acute indigestion. The estate that was left by Payne Whitney was the largest ever recorded up to that time, roughly $180,000,000, which also produced the largest death tax ever recorded, $20,000,000. In 1924 Whitney had paid the third highest income tax in the country behind John D. Rockefeller Jr. and Henry Ford. He left $60,000,000 to charities, institutions and organizations. 'Greentree' continued to be owned by the Whitney family throughout the 20th century and now functions as the Greentree Foundation, a conference center dedicated to international justice and human rights. Click HERE to see 'Greentree' on google earth and HERE on bing. Photos from Town & Country, 1917. Duh. Coincidentally, in the course of some research, I came across architectural drawings for the renovation and enlargement of the second Mrs. Whitney's Bar Harbor summer cottage (Mr. Whitney rented a large place nearby for the summers that he was courting her)dated 1898, the drawings include a large billiard room addition--for the new husband, of course. That year, she was severely injured in a horseback riding accident, and died of the effect agonizing months later. The billiard room was never built, but heartbroken Whitney continued to own the house until his death in 1904. Didn't connect all the dots until reading this post today. Apparently the children didn't reconcile with their father even during the agonizing months his wife was dying. People can behave so badly. Sorry, I digressed. As to Greentree---the same program as Wheatley, but not as skillfully played out. Lovely land, barely holding against the development beyond. I was lucky enough to visit Greentree many times in the late 1970's/early 1980's due to a friendship with a Whitney grandchild. These photographs barely hint at the size of the place- skillfully designed so that it appeared to be a rather grand farmhouse from most angles, but it went on and on.... and on. "Oh, look, an indoor swimming pool", "and here's a court tennis court". The famous Whitney impressionist paintings were very much in evidence, and the place was maintained to a degree that still, in retrospect, astounds (I remember looking up at an outdoor light fixture at one of the farthest reaches of the house, its glass shade as sparkling as if it had just been installed. And although meals were served by a butler and footmen dressed in swallow tailed coats, the decoration of the house (despite those eye popping paintings) was simplicity and appropriateness itself. I think that it was the last of the grand houses in the United States still run as it had been when it was built, and it was an amazing lifestyle to behold. Truly one of the last of the great estates. Still run in the old manner. If you are a guest there today it is as if nothing has changed, although the death of the butler a few years did have an impact. DED-actually amazing that the land has survived at all, after all, you are one half an hour from Manhattan in a spot where anything built, sells,still, for ridiculous prices. 400 acres thee is worth close to $1 billion if zoned as the adjacent residential. If zoned as adjacent commercial-several $billion. The Whitney family in Manhasset, through their numerous charities and generous donations of land, time and money, have been an examplary model for other families of great wealth. When I chastised the Phipps family for their short-sighted destruction of their landmark worthy home, Springhill in the 1970's, it is in comparison to the Whitneys, who not only laid the foundations for numerouis LI institutions, such as North Shore University Hospital, but managed to keep their greatest asset, their estate, intact for future generations. Bing shows the encircling development and Greentree could well have gone the same way, but the open space will be a priceless treasure for years to come, Right now the family contiues to pay the taxes and the Town will have the first opportunity to obtain the land if it ever were to be offered for sale. They have found a useful and noble purpose for their home as an international, non-profit conference center, picking up on the long history the area played when it hosted the early meetings of the United Nations, held in nearby Lake Success. LI shoud be forever grateful for such a forward thinking and generous family. If not for Springhill's large lot sizes, the Phipps estate would look like the old Willaim Paley property just to the south on Shelter Rock Road, overrun with cul-de-sacs and large homes on postage stamp parcels with little natural beauty preserved. In 1999 the estate of Betsey Cushing Whitney sold the property for $5.5 million to Texan, Robert McNair, who renamed it to their racing name Stonerside. He in turn after focusing on his NFL team (the Houston Texans) sold the very lovely 106-acre estate in 2007 to Sheikh Mohammed bin Rashid Al Maktoum, the ruler of Dubai, for $17.5 million. It was renamed Greentree Training Center. The property is rather lovely with not only the stables, but also the mansion as well. That slate-roofed manor (c.1870) is 8,000 square feet, seven bedrooms, seven full baths and eight fireplaces. The screened porch has a view of the private one-mile training track and Vermont’s Green Mountains. Impressive accommodations back in the day (and even today) for just being used 2-months of the year at best. The purchase by the Sheikh was welcomed by the city not just in his preservation but also tax revenue. The year prior to purchase $143,087 in annual taxes were paid, after rehab work on the barns the annual tab jumped to $335,340. The Phipps family did everything you described... just with 'Westbury House' and not 'Spring Hill'. I don't feel 'Greentree' is a good comparison with 'Spring Hill' unless you also consider the extenuating circumstances surrounding the two..which have two completely different stories. And I am in no way defending the demolition of 'Spring Hill', but context must be applied to the circumstances. I can elaborate but it would be rather lengthy. Magnus, I too had the pleasure, as a member of the NYS Preservation League, to lunch at Greentree; Betsey was the host, but when the day arrived, the butler, Emil, informed our group that she was indisposed and he would be our host. In addition to the eye-popping artwork everywhere (a Van Gogh self-portrait hanging in the hallway between the living room and library), what struck me most is just how elegantly domestic and comfortable a family home it was ––– no "impress the guests" effects, just easy, lived-in opulence. The main stair was stunningly understated. There was a room on the ground floor, facing the garden, that had obviously been set up as a bedroom for the then aging Betsey, with a short half-step out to the garden beyond. Betsey & my Nana were members of the same congregation and an associated garden club, which Betsey often hosted at Greentree, and during the long, long walk to the palm house (where an alligator was once in residence), I remember thinking, "so this is where Nana fled to on those weekends". As for the encroaching development, back in the day Betsey sued the town when they rezoned the property, claiming it was devalued by $40M dollars (it's the largest water recharge area in Nassau); rumor has it not so much for economic reasons, but as old school wealthy she was insulted that the town wouldn't trust her, after all the family had done for it, to do right by the preservation of the estate as they believed none of the heirs would take on maintaining the estate. The demolition of Kiluna Farm, sister Babe's estate (joined to it by Baragwanath Blvd., named after Neysa McMein husband), and the subsequent rise of the odious Stone Hill development must have been chilling. Both 'Spring Hill' and 'Greentree' were built in 1903. 'Spring Hill' was built for William L. Stow who went bankrupt by 1908 and the house was eventually sold to Henry Carnegie Phipps (unlike 'Westbury House' which was built for John S. Phipps). 'Greentree' was built for Payne Whitney. Payne Whitney died in 1927 and Helen Hay Whitney in 1944. Henry Carnegie Phipps died in 1953 and Gladys Mills Phipps in 1972. In 1929, when H.C.'s son Ogden married, he was given a large Delano & Aldrich designed house about 800 feet away from 'Spring Hill' in the northwest corner of the estate. Upon Ogden's mother's death in 1972, not only was there no one else living in the manor house, Ogden had been living in his house for over 40 years. I assume Jock Whitney inherited 'Greentree' following his mother's death in '44 and made it his residence. He died in 1982. His second wife (whom he married in 1942) continued to live in residence until her death in 1998. Ogden Phipps passed away in 2002. He continued to own 'Spring Hill' through his death. If one would have wanted 'Spring Hill' to remain and be opened as either a botanical garden, conference center etc., you would have to assume that Ogden wouldn't mind people tromping through his backyard, literally surrounding his house. The Phipps family is quite private and while I never knew Ogden and certainly can't speak for him, I do not think this was a concept he ever entertained. So I suppose the other option would have been for Ogden to bite the bullet and move, thus saving 'Spring Hill'...but his family had been in Old Westbury for 75 years at that point and I also think this was a notion he did not entertain. Since he lived another 30 years after his mother's death, and he had his own fairly old house right next door, it seems unlikely any of that would have ever happened. Unlike 'Greentree', which was occupied as a private residence until as recently as 1998. Ogden's D&A house was occupied by his family until 2007. It recently sold. And I don't think Peggie Phipps Boegner would be a fair comparison either. Yes, she lived in 'Old Orchard' for many, many years while Old Westbury Gardens was open to the public. But Ogden was at the time head of Bessemer Trust, head of NYRA and chairman of The Jockey Club. Greentree may have been my favorite of the Parish-Hadley projects during my tenure in the 1980s. One was always treated as a guest when there, the butler asking if one would like to swim or play golf before returning to the office. And there was a huge staff, always happy to see someone and having something to do, constantly bringing trays of sandwiches, freshly baked cookies, and spiced ice tea. Mrs. Whitney carrying a handbag in her home is an image I'll never forget. But the most memorable thing about the house was the incredible art. Zack, well we can agree to disagree. 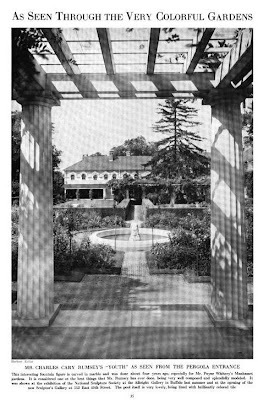 I agree with one thing, the comparison that Westbury House was saved, but saved virtually single handedly by Peggie Phipps Boegner and she lived quite happily in a house nestled on the grounds, but hidden from view, yet she was always found interacting with visitors as she roamed the gardens and truly enjoyed, I believe, the fact that so many appreciated the home that she loved as a child. She gifted LI a true treasure that no amount of money could ever compare to. On the other hand, Ogden's D&A home is also on the Springhill property, but is in fact very deeply buried in the woods on a hilltop, visible from Glen Cove Road in the winter, so privacy could certainly have been maintained. I simply presume he did not care for preservation or simply had no vision or desire or the home would have survived. You dont discard your antiques and artwork at the curbside and by the 1970's you should have been aware that you held an architecturally significant home which you choose to destroy. While many of the great homes did not survive the 30's, 40's and 50's, Springhill was intact and in good repair to the end. I just say one should have known better and if not then shame on them. While their homes were open to the public, the Vanderbilt descendants live at Biltmore, the Harrimans lived on the grounds of Arden House, the Vanderbilts again summered at the Breakers, just a few of many examples of "if you want to preserve you can easily find a way to make it happen". The Whitney family is singlehandedly spearheading the preservation not just of their home, but of precious open space and an important groundwater recharging area and I think "Shelter Rock" a well known indian shelter, is also on their property. Kudos to them for their vision and generosity. One only has to look at the remnants of the Paley estate to see what could have been. I'm not really disagreeing, in a perfect world 'Spring Hill' would still be standing and it would be a botanical garden. And so would 'Pembroke'. And so would 'Farnsworth'. And 'Matinecock Point'. And 'Peacock Point'. And 'Meudon' for that matter. Just trying to put it in context of what was happening at the time. Cause and effect. Imagine if Harbor Hill, quite nearby (demolished in 1947), had been preserved the same way. One has to wonder if, at the time, there was any local opposition to opening these estates to the public, or if, at the end of WWII sentiment ran against these estates and the way of life they represented. Since Spring Hill survived another quarter of a century after Harbor Hill, and in good repair, I hope it at least was opened up for use by the family on special occasions. Whatever the reason for its demolition, I cannot imagine it was an easy decision, or one taken lightly, at the time. Given the family's presevation of their other properties, surely the reason to demolish such a tour-de-force must have been reluctant at least, if not outright painful. From my understanding I do not believe Spring Hill was ever opened to the general public while it was an intact estate. Horse trails that would have led through the property were also blocked with locked gates. This was due to the fact that Hal and Gladys (and later Ogden) would keep some of their prized horses on the property and did not want to run the risk of an unknown horse bringing in some kind of illness. Searching the NYTimes you'll find that many of the surrounding estates were opened from time to time in the 30s and 40s for garden tours but I have never come across one for 'Spring Hill'. There is a great article on the coming out party for Ogden's daughter Cynthia in the mid 60s...2,000 guests and lanterns lighting the entire length of the driveway. Oh to see Harbor Hill in all its glory....that would be amazing. Well Zach I think you summed it up by mentioning the locked horse trails. Those trails established decades ago were meant to be maintained as an unwritten rule of sorts between neighbors and shared by local equestrians, so the locked gates speak volumes. To this day one can ride for miles through the properties of some of the wealthiest families, but I guess not the Phipps family at Springhill. I dont think they hold much value in preserving their properties with the notable exception of the remarkable Peggie Phipps Boegner. They just happen to have enough money to maintain the homes that they occupy, but I dont see any forethought or planning as to what the future will hold for those properties. They get sold to the highest bidder. Great Neck luckily purchased one for administration offices. Knole was left on its own and barely escaped demolition. I am sure the developers cant wait to get their hands on Erchless. Maybe one should be thankful that at least one family member had a more magnanimous vision for her home. Well there are horse trail easements that run along the borders of private property in Old Westbury, which are accessible to all, and then there is the unwritten rule from 100 years ago that you were allowed to ride through someones property as long as you did just that...ride through. The Phippses never stopped anyone from riding on a public horse trail that existed by easement, thereby accessible to all...merely those that led onto their private property. They had very valuable horses kept there and wanting to keep strangers off of private property doesn't seem like too much to ask. I guess the real reason there are such ambiguous emotions about Spring Hill's demolition is the absence of any clear cut reason for it; if it had been dilapidated or fire damaged & ordered torn down for safety reasons, one could accept that. Even a crushing tax assessment would be understandable. But for such a dynamic home in good repair to be suddenly demolished leaves too many unanswered questions; I'll never forget the day, passing by, when I first noticed Spring Hill was no longer there, and the awful realization that these mansions I so loved were not eternal. Ogden clearly wanted to keep the property following his mother's death in '72. He was 64 years old. His house on the property, which he had been living in since he was 21, was over 40 years old. There was no one to live in the main residence and by that time that kind of life style was disappearing (and the house was 70 years old). As luxurious as Ogden's own house is, it was much more befitting of the current lifestyle than Spring Hill was. Assuming the tale about the taxes is true...given he lived another 30 years, and assuming no increase in taxes (which is obviously unrealistic) at 80K a year it would have cost him close to $2.5 million over the rest of his lifetime, just in taxes, to keep Spring Hill standing...empty. Ogden was a businessman, and removing emotional attachment from it, it didn't make financial sense (no matter how wealthy the family) to keep it standing. That is what I believe to be the reasoning for it. It wasn't turned public because the family continued using the rest of the estate; stables, greenhouses, outbuildings and all. They clearly didn't want to let that go. I wish things had turned out differently. I also feel "Spring Hill" is one of Long Island's greatest losses...what also bothers me is at the time of the demolition, Mr. Phipps was the richest man in America, I'm sure he could of set up some trust to insure the survival of his family estate, but American's don't feel the same way about family estates as do Europeans. Also very sad about "Knole" being abandoned by the Martins. Although I do understand the children reside in Europe and Palm Beach, I feel they should have rallied together to save the home their Father loved till the end. I don't presume to know the Phipps family, but I feel the owners of "Erchless" are much like their cousin Peggy Boegner in loving and preserving their home. "Erchless" is one of the very,very few estates that maintains property, ( I hear that the only reason the high school was built, was that Mr.Phipps planned on donating the land, but forget to state on his passing, so he was somewhat forced to give the land sooner than he intended, so if not for that, he would still own up to Jericho.) And the house itself is perfect from what I saw of the outside on a garden tour. I too think the demolition of Spring Hill was a tremendous loss though hardly uncommon. I also think as Zach stated, or implied, in one of his many comments, that the fact that Stow built the house and that Ogden really had no particular sentimental attachment to it distinguishes this case from Greentree and Westbury House. Also, credit should be given for keeping the land intact for so long. Finally, when Dinny sold the property he went to great lengths to try and find a buyer who would maintain it. By the time Harbor Hill was demolished (shudder) the house had been empty for years and the great family fortune quite diminished. We can perhaps, frown upon the Mackay's for allowing the 300 year old, manageable and updatable, Underhill House on Factory Pond Road to be demolished at a time when they should have known better. I sadly concluded, long ago,after many years of arguing this very point with my father, that we cannot, and probably, should not, rely on families alone (usually with diluted fortunes and far flung heirs) to preserves huge estates and houses that are obsolete (particularly within commuting distance to NYC, where land is so valuable)-much as I love them. At the end of the day, I think the real fault lies in the villages (particularly Old Westbury) that stick to their outdated zoning codes which are predicated on the concept that as long as everyone has 2 (maybe 4 or 5) acres we will all be fine. Had they allowed/required flexible lot layouts, Knole's gates could have remained as the main entrance to the house and the allees could have been kept intact. The few exceptions (Banfi/Rynwood, Ontare and further afield , Whitefield in Southampton) show that good things can be done. On another note, I agree Harbor Hill Stables were magnificent. Yes, the burden and guilt also is with the towns as noted, but when in possession of a nationally important building you make an effort to do something about its survival. You dont bring in the wrecking crew before exploring every avenue. Many homes on OLI are very nice and many are notable, but few could rank as leading examples of their design period. 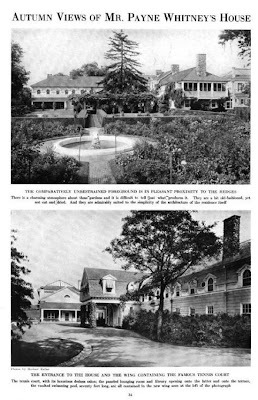 Springhill survived until the 1970's in private hands and could possibly be considered one of the last great mansions of its era on LI. Certainly an interesting discussion with regards to how to preserve some grand estates while not mandating they become none-for-profit open tourist sites. Sadly there is a sentiment (and growing) that exists in the public and city halls whereby many don't want to shield "the rich" from what they perceive is their fair share of taxes. That foolish black and white view all too often ignores the fact that many of these grand homes almost cannot be given away and languish on the market for years despite prices being competitive for the square footage and/or land - yet its just assumed the owner must be wealthy and if they cannot afford it then so be it - sell it. (How many years has Cornelia Guest's Templeton sat on the market.) Then plenty of hand wringing when the owner takes drastic measures after bleeding ink for years and develops the old family manse or razes it. A private residence/owner receiving a special dispensation with taxes - in order to dissuade an owner from ruining a treasure - on the face of it would generate howls. While some communities do have some financial discretion say with an elderly owner, and land preservation activity more advanced, in general its hard not to foresee a backlash if the financials get out. Alas we are too often a petty nation that resents if x owner on 10-acres is paying less than the guy on 5-acres just because the one property is historic and the other isn't. I'd love to change the game but it really will be harder to do so with financial burdens with the State of NY and the patchwork of municipalities on the North Shore just likely to get worse in the decades to come. Zach where are the Old Westbury horse trails located? I believe Ogden spent alot of time on his houseboat Chanticlear in Palm Beach. I was in Ogdens home in the lat 1980's he owned one of the largest collections of french style furniture in the world. His staff maintained his home very well. What are the plans for Erchless? It always looks deserted. Who lives there now? Who would I address a letter to? Mr. and Mrs. Howard Phipps Jr. still reside in 'Erchless'. Not abandoned in the slightest...the grounds and house are kept in tremendous shape. The horse trails in Old Westbury are all over...something like 30 miles in total. The Old Westbury Horsemen's Foundation has maps... I assume someone at the Village hall could provide one. There actually are excellent tax incentives for anyone who forgoes subdivision- issue remains of what to do with large properties. Cornelia Guest's property is, in my opinion, an excellent and sad example of another problem we face. It seems unlikely that someone who appreciates the wonderful house and grounds would possibly want to live on I.U. Willets Road-the poster child for how quickly a beautiful neighborhood can be destroyed. Is it true Mrs. Howard Phipps is a Whitney? Maybe that is why "Erchless" is so well preserved, (well, except for the fountain below the rear garden stair). I met her twice at a volunteers Christmas party at Old Westbury, and she seemed to be a very kind and down to earth woman. Just wanted to correct myself, Gladys Mills Phipps passed away in 1970 not 1972. "What will happen to Palm Beach then I don't know. Some people think it's progress and some don't. Nobody lives in his father's house today. I couldn't afford to live in my father's house and my children won't live in my house. They don't want to. That's what makes real estate, you might say." "Just west of the former Garvan estate, Ogden Phipps is reported to have demolished the Georgian-style mansion of his estate, and Mrs. G. Macculloch Miller is said to have done the same on her property to the east. Their estates remain unsubdivided." "According to Peter D. Garvan, a lawyer who lives near the family's former estate, said the tax burden is a principal reason that owners demolish such mansions. But taxes are by no means the only reason." "They played no part at all for example, in the decision of Selig Burrows to raze the 37-room former Lehman mansion adjacent to his own ultramodern home in Mill Neck, he said the other day. Mr. Burrows recently acquired the 13-acre Lehman property with the intention of keeping it rented. But when the tenant moved, he was unable to rent it out or sell it, he maintained. "It was unfortunate and with great regret that I decided it had to be torn down" he said. "It couldn't be properly air-conditioned and it was no longer rentable or salable. The clincher was the energy crisis."" Excuses are many. If you are determined to tear something down, very little will convince you otherwise. It doesnt have central air, the kirchen is old fashioned, the bathrooms need upgrades, the garage is not attached, the floors creak, its too dark, etc, etc. While every house doesnt need to be saved, many were needlessly demolished when they could easily have functioned very well in another capacity. (Is it such a waste of materials, resources, craftsmanship, etc to demolish one of these well built homes) Plus there have been so many preservation tax incentives and landmarking laws that have helped many people preserve their properties, those quotes above are just excuses and a sad reflection on how we view our heritage, but it comes down again to the families interest in pursing alterenatives and other options. Obviously Ogden Phillips had no interest whatsoever except to keep people off his Springhill property. Its also ultimately not about living in these homes as many are impracticle for a family today, Its about securing a significant architectural building's future in any one of a few hundred possible alternatives to demolition. It has to be ones determination to do it. As with Peggie Phipps Boegner, she had the will and determination, but also the largese to save and share her families property with future generations of people to enjoy. There are very few people who possess such noble characteristics. Thank you to her. Landmark laws were brand new by the early '70s (NYC's was less than 10 years old) and tax incentives for preservation didn't really exist at that time...it was all the demolition that took place during the era that spurred their creation. Also interesting to note that Michael G. Phipps is Peggie's brother. The Federal Rehabilitation Tax Credit, created in 1976, provided tax breaks and incentives for people to rehabilitate historic properties but doesn't mention tax breaks for already standing and in good repair historic structures. "Can the 20% federal tax credit be used to rehabilitate an owner’s private residence? No. The 20% credit is available only to properties rehabilitated for income-producing purposes, including commercial, industrial, agricultural, rental residential or apartment use. The credit cannot be used to rehabilitate your personal residence in which you live." So it would apply to Banfi Vinters and their commercial use of 'Rynwood' it isn't applicable to an owner trying to stave off the burden of taxes with a private home. Zach, unfortunately the tax laws really favor conversion of historic properties for commercial enterprises not so much for residential use, but these homes are ultimately geared for commercial/institutional adaption anyway. I also forgot that we are speaking about Old Westbury and not Newport or Charleston where preservation is in the blood of the town and its citizens and preservation started long long before any official tax incentives. One has to have the desire and determination, which doesnt live in OW. Plus, I was focused on Springhill and since it survived into the 70's, in good repair, there is no excuse for not making arrangements for its adaption to another use, no excuse. I am not letting them off the hook for that poor decision. Also the Phipps families Palm Beach home was quite enormous and it being in a residential location, there were probably no alternatives for its re-use, unless the town and citizens could come to terms with conversion to a small hotel or condos and we all know how well that idea would fly. Join HDC and neighborhood partner, the Two Bridges Neighborhood Council, to learn about available financial resources for rehabilitative work to your historic building. The State and Federal Government now subside up to 40% of qualified rehabilitation projects through existing and new historic preservation tax credit programs. Developers and homeowners have successfully used these credits to rehabilitate historic buildings for residential and commercial use. Come learn how to access State and Federal Historic Preservation Investment Tax Credits to maintain & rehabilitate historic properties. technical advice to building owners, both non-profit organizations and individuals. Canal & Bayard in Manhattan, a contributing resource to the Chinatown & Little Italy National Register Historic District. Chinese translation will be provided. yes Kellsboro supplied the details about tax advantages, but again, these homes are not suitable for most families, but are quite adaptable for other purposes so the fact that the families and towns are not open minded to adapt to different zoning, usage and preservation laws not only diminishes the beauty of their own towns but affects all of us with the loss of history. I'm not trying to let anyone off the hook for the destruction of any historic house. Merely trying to point out that the desire of Ogden to retain the property for another 30 years and use it was clearly an impediment to the house being converted to an alternate use. If you want to put some kind of blame on Ogden for not being more noble and forgoing his own family's privacy and desire to retain his property for private use in the name of preserving the house his father purchased in 1908 that is certainly your prerogative. Zack. forward the email to every village trustee on Long Island, they might actually learn something in one of those workshop oh, right, who am I kidding? Has anyone walked the old westbury horseman's trail? Is there anything to see of interest? Does it pass any estates that can't be seen by driving past them? Does it go south of the LIE? It isn't one trail...it's many trails scattered throughout the entire Village of OW. Some are long, some are short. Many run through the woods in SUNY OW. Some run into Brookville where there are many more. They all run in between private property so there are occasional rare glimpses you can see of the back of a big house.